B. USB OF IFF IN THE CONTROL OF AIRCRAFT. C. LIMITATIONS OF IFF IN LARGE AIR OPERATIONS. D. CONDITIONS OF IFF SILENCE. IFF is an electronic system installed in ships and aircraft which serves to indicate their friendly nature to other friendly units properly equipped. Its nature is such that identification is possible at great distances and when visual contact is impossible. The development of IFF began almost as soon as the first radar set was built. Early difficulties were experienced, among them the introduction of new radar equipment using different frequencies, and the persistent demands for greater identification range. These were in part overcome by the successive introduction of IFF Mark I and Mark II. Both of these systems employed a combined receiver-transmitter which was energized by the receipt of a radar signal. The tuning of the set was mechanically swept through the bands of radar frequencies then in use, so that any radar would receive periodic identification signals as the receiver-transmitter passed through the radar frequency. Radar equipment now operates on such a large number of widely separated frequencies that it has become impractical to produce a single IFF set capable of tuning to all of them. 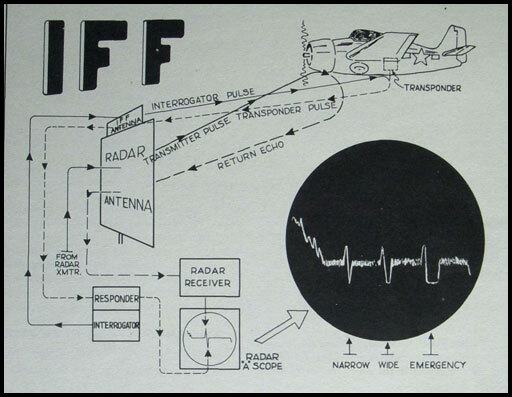 This difficulty has been overcome by the introduction of a universal frequency band for IFF, separate from that of the radar equipment The first of this type of equipment installed in ships and aircraft is the IFF Mark III which is in use at the present time. In control of aircraft, IFF provides a method of distinguishing friendly from hostile aircraft as they are detected by radar. This permits appropriate action to be taken when the aircraft are first detected. It allows defensive action to be planned against hostile aircraft. 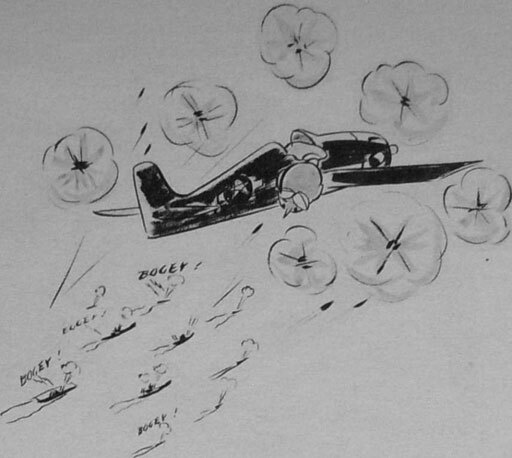 Interception with friendly aircraft can be started immediately and antiaircraft screens and batteries can be alerted. The chances of enemy aircraft approaching above the radar horizon without being engaged and brought to battle are substantially reduced. Friendly aircraft can proceed and return on various missions without being investigated every time they appear on the radar screen. Consequently, needless alarms and expenditure of effort on the part of other friendly forces can be avoided. Aircraft which encounter mechanical or other difficulties--lack of fuel, battle damage, weather conditions, or other reasons--can use the system to identify themselves by switching their IFF to the EMERGENCY code position. Lost planes are frequently located and homed through use of the EMERGENCY signal. If radio silence is in effect, friendly aircraft, which have a contact or are shadowing enemy surface units or aircraft, can alert CIC by switching to the IFF code prescribed by doctrine. Figure 53.--The Mark III IFF system. Identifying individual friendly aircraft or flights of friendly aircraft by IFF is possible by assigning different codes to aircraft on various missions (such as one code for CAP, another for ASP, etc.). However, when dealing with a group of planes showing MK III IFF it is very difficult to distinguish between codes 1, 2, and 3 or between codes 4,5, and 6. Friendily aircraft can be tracked by "IFF ONLY" when aircraft are in radar fade areas. indicating the friendly nature of the plane in question. Information of the search plans for all aircraft in the operating area, approach and return routes of strike aircraft, air transport routes in the area, and information concerning the day to day movements of friendly planes on special missions must be kept up to the minute. Comparison of the track of an unidentified air contact with these prescribed routes may explain some "friendly bogeys." However, it is absolutely imperative that all questionable air contacts be investigated by combat air patrols to insure the safety of the task force or task group. The characteristcs of the Mark III IFF system are such that it is subject to many weaknesses, both human and mechanical. Battle damage to IFF units can be expected and an aircraft suffering this damage can sometimes identify itself by following the prescribed route of approach. If conditions permit, attempt should be made to identify the aircraft by calling it on voice radio and having the pilot identify himself by orbiting or changing course. Whenever possible an aircraft with faulty IFF should be ordered to join up with other friendly planes which may be in the vicinity. It is also imperative that all aircraft with faulty IFF be relieved immediately and landed as soon as the air operation schedule permits. Whenever a pilot realizes that his IFF equipment is inoperative, he must report his approximate position, course, and speed to all bases in the vicinity. The Mark IH IFF system is the primary electronic means of establishing the friendly nature of air and surface targets. Certain limitations in its use, however, must be thoroughly appreciated by all CIC personnel and pilots. The distinctive coded response of aircraft IFF is readable over a sector in azimuth which corresponds roughly to the width of the transmitted beam. However, it does correspond to the range of reflected echo. This means in practice that two aircraft at the same range but on slightly different bearings (10°-15°), only one of which has its IFF equipment energized, may both appear to be transmitting the proper signal. The same is true for planes at the same range and bearings but at radically different altitudes. No positive method for overcoming this condition has been devised. Skilled radar operation may reduce the inherent dangers, but the possibility of enemy planes sneaking in under cover of our friendly planes' IFF signals can never be ignored. This "parasitic" use of IFF exploits the major weakness of the system. It makes mandatory the employment of all methods of identification when many friendly planes are operating in the vicinity, for scopes which are saturated with IFF returns are not conducive to the easy recognition of bogey signals. Conditions of IFF silence have been prescribed in fleet publications for two purposes. The first is to avoid interference caused by excessive functioning of transpondors, and the second is to prevent the enemy from employing the IFF signals of our planes to his advantage. The first of these is by far the most important. In a task group consisting of 8 capital ships and 12 destroyers, there may be as many as 50 interrogators. Many of these will operate of necessity on the same, or nearly the same, frequencies. When an interrogator energizes the transpondor in a friendly target, the transmitted signal will appear on all other responsors of the same frequency as interference. When there are a large number of interrogators operating simultaneously, the interference caused may render it extremely difficult to distinguish a target's IFF. This frequently occurs when a task force is tactically concentrated. To alleviate this condition, the OTC will put into effect a condition of interrogator silence. This will deny the use of the interrogators to many of the ships and so cause a considerable decrease in transpondor transmissons. For instance, a typical condition of interrogator silence might require that only carriers and ships assigned radar guard duties operate their interrogators. frequencies which do not fall into the IFF band. Enemy radars, however, may, and often do operate in our IFF band. When this happens, the transpondors are energized and the IFF signal appears on the enemy radar screen. This may enable the enemy to detect and track our planes beyond the normal range of his radar. Furthermore, it definitely indicates to the enemy the identity of the planes. turning the IFF on again when returning to their bases must be stressed to the pilots. The advantages and disadvantages of having friendly planes turn off their IFF's should be carefully weighed before any condition of transpondor silence is imposed. Mark III IFF is compromised and is possessed by every major power. In the interim period until new equipment is in the Fleet, Mark III IFF is valuable for training. Some identification is possible by the use of codes (both "A" and "G" bands), but such identification is not positive.